Mai, Z. & Yip, V. (under review) Trilingual first language acquisition: Leo Corpus. Leo was born and raised in Hong Kong. His mother is an early bilingual equally proficient in Cantonese and Mandarin, and his father a native speaker of a Chinese dialect and Mandarin. Both parents speak English as their second language, but the language between them is Mandarin, with occasional switches to Cantonese and English. The family initially adopted a strict ‘one parent-one language’ practice in which the mother spoke to the child in Cantonese and the father in Mandarin. Leo’s paternal grandmother also addressed the child consistently in Mandarin. 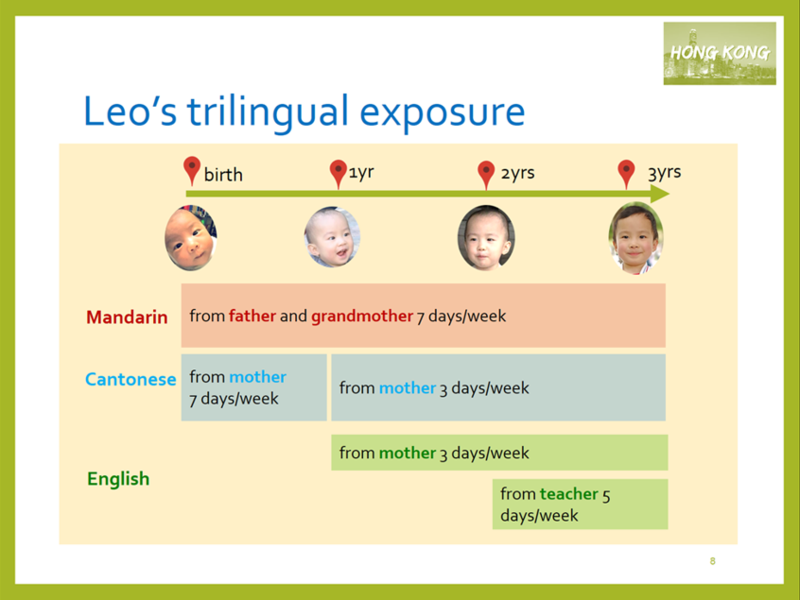 Leo’s systematic exposure to English began at 1;01 when his mother started to interact with him in English every other day in a week and Cantonese the rest of the days, hence the “one day-one language model”. From 1;02, Leo also received regular English input from native speakers of British and American English in weekly playgroup or private tutorial play sessions, and later from teachers at international nursery schools and kindergartens, where English is the medium of instruction. Another important source of English input comes from a Filipino domestic helper, who interacted with Leo frequently in English from 2;02. Leo has been video-recorded by a parent or research assistant using Sony HandyCam and H2N audio recorder every week since 0;06. In the initial release of the Leo Corpus, we selected 54 recordings made in 18 consecutive months from 1;06-2;11. Each recording consists of 30-minute video documentation of the child and an adult engaged in daily routines such as games, role-playing, story-telling and dining at home. Each recording session focused on only one language as the target language, with only one adult interacting with the child. The adult interlocutors were chosen to sample the input Leo regularly received, that is, Mandarin from his grandmother and father, Cantonese from his mother, and English from his mother, helper and school teachers (represented by a research assistant, who is a native speaker of American English, in the recordings). Below is a full list of recordings and main adult interlocutors. The resulting corpus contains a total of 44,846 utterances, of which 11,884 were produced by the target child, and 32,982 by the adults. The speech data were transcribed and tagged by trained research assistants. The child’s mother manually checked all the transcripts for accuracy. The corpus, including transcripts and corresponding audio recordings, has been deposited in the Child Language Data Exchange System (CHILDES, MacWhinney, 2000, doi:10.21415/T5V398). For access to the video and wav sound files, please contact the authors. Here are some linguistically interesting highlights, selected from the video documentation of Leo interacting with adults in the preparation stage (0;07-1;05) and the released period (1;06-2;11) of the Leo Corpus. *FAT: 啊 这个 什么 呀 ? %mor: sfp|a1 pro|zhe4ge4=this pro:wh|shen2me=what sfp|ya ? *CHI: [- yue] 車車 . *FAT: [- eng] yes . *FAT: 车车 [/] 车车 . *CHI: [- yue] 豬豬 . *FAT: 豬豬@s:yue 在 哪儿 啊 ? %mor: L2|豬豬 prep|zai4=at pro:wh|na3-DIA=which sfp|a1 ? %exp: the child pointed on the book . *CHI: &a &ju &zhu . *FAT: 哦 这个 呢 ? %mor: co|o1=chant pro|zhe4ge4=this sfp|ne ? *FAT: 这个 也 是 豬豬@s:yue 啊 ? %mor: pro|zhe4ge4=this adv|ye3=also v:cop|shi4=is L2|豬豬 sfp|a1 ? *FAT: 这个 是 什么 呀 ? %mor: pro|zhe4ge4=this v:cop|shi4=is pro:wh|shen2me=what sfp|ya ? %exp: the father laughed . *FAT: 诶 , 对了 ! %mor: co|ei1=ey cm|cm co|dui4le=correct ! *FAT: 猫猫 [/] 猫猫 是 怎么 叫 的 呀 ? %mor: n|mao1&DIM=pussycat v:cop|shi4=is adv:wh|zen3me=how v|jiao4=call nom|de sfp|ya ? *FAT: 那 是 狗狗 吧 . %mor: pro|na4=that v:cop|shi4=is n|gou3&DIM=dog sfp|ba . *FAT: 猫猫 是 喵 . %mor: n|mao1&DIM=pussycat v:cop|shi4=is on|miao1=meow . *HAN: oh , very nice . %mor: co|oh cm|cm adv|very adj|nice . *HAN: I like your dress . %mor: pro:sub|I v|like det:poss|your n|dress . *HAN: what color is it ? %mor: pro:int|what n|color aux|be&3S pro:per|it ? *HAN: wow , I like my dress too . %mor: co|wow cm|cm pro:sub|I co|like det:poss|my n|dress adv|too . *HAN: what color is my dress ? %mor: pro:int|what n|color cop|be&3S det:poss|my n|dress ? *FAT: 哎哟 , 那 爸爸 看 一下 这个 跳伞 . %mor: co|ai1yo1=arrgh cm|cm pro|na4=that n:relat|ba4&DIM=father v|kan4=look adv|yi1xia4=a_bit pro|zhe4ge4=this v|tiao2san2=parachute . *FAT: 哎呀 , 爸爸 好 想 去 跳伞 呐 . %mor: co|ai1ya1=jeez cm|cm n:relat|ba4&DIM=father adv|hao3=very v:aux|xiang3=want v:dirc|qu4=go v|tiao2san2=parachute sfp|na . *FAT: 爸爸 还 没 跳 过 伞 呢 . 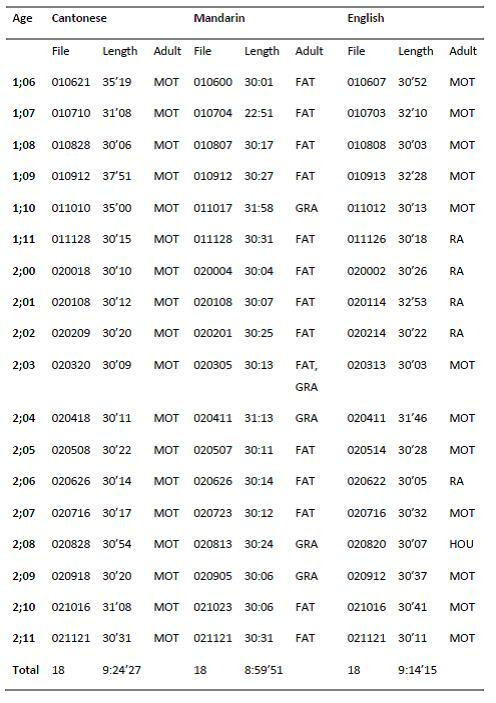 %mor: n:relat|ba4&DIM=father adv|hai2=still neg|mei2=not v|tiao4=jump asp|guo4 n|san3=umbrella sfp|ne . *CHI: 被 bi4bi2@s:yue 跳 了 . %mor: n|bei2=quilt L2|bi4bi2 v|tiao4=jump asp|le . *FAT: 什么 被 bi4bi2@s:yue 跳 了 ? %mor: pro:wh|shen2me=what n|bei2=quilt L2|bi4bi2 v|tiao4=jump asp|le ? *CHI: 绳 被 bi4bi2@s:yue 跳 了 . %mor: n|sheng2=rope n|bei2=quilt L2|bi4bi2 v|tiao4=jump asp|le . *MOT: 伞 被 bi4bi2@s:yue 跳 了 . %mor: n|san3=umbrella n|bei2=quilt L2|bi4bi2 v|tiao4=jump asp|le . *FAT: [- eng] okay . *FAT: 你 跳 过 伞 啊 南哥 ? %mor: pro|ni3=you v|tiao4=jump asp|guo4 n|san3=umbrella sfp|a1 n:name|nan2ge2 ? *FAT: 你 跳 过 伞 没 有 ? %mor: pro|ni3=you v|tiao4=jump asp|guo4 n|san3=umbrella neg|mei2=not v|you3=have ? %exp: the child stood up and jumped . *FAT: 哦 , 你 要 跳 是吧 ? %mor: co|o1=chant cm|cm pro|ni3=you v|yao=want v|tiao4=jump tag|shi4ba=right ? *FAT: 哦 , 跳伞 跟 跳绳 不 一样 . %mor: co|o1=chant cm|cm v|tiao2san2=parachute prep|gen1=with v|tiao4sheng2=skip_rope neg|bu4=not adj|yi1yang4=same . *FAT: 跳伞 [/] 跳伞 跟 跳绳 不 一样 . %mor: v|tiao2san2=parachute v|gen1=follow v|tiao4sheng2=skip_rope neg|bu4=not adj|yi1yang4=same . *CHI: bi4bi2@s:yue 想 跳绳 . %mor: L2|bi4bi2 v:aux|xiang3=want v|tiao4sheng2=skip_rope . *FAT: bi4bi2@s:yue 想 跳绳 啊 ? %mor: L2|bi4bi2 v:aux|xiang3=want v|tiao4sheng2=skip_rope sfp|a1 ? *MOT: why do you not want this ? %mor: pro:rel|why mod|do pro:per|you neg|not v|want pro:dem|this ? *MOT: because it’s green ? %mor: conj|because pro:per|it~cop|be&3S adj|green ? *MOT: <green is a> [/] green is a good color . %mor: n|green cop|be&3S det:art|a adj|good n|color . %exp: the mother put the green crayon next to the green water bottle for comparison . *MOT: see [/] see . *MOT: now you want it ? %mor: adv|now pro:per|you v|want pro:per|it ? *CHI: this is I’s lion . %mor: pro:dem|this cop|be&3S pro:sub|I~cop|be&3S n|lion . *MOT: oh , this is your lion . %mor: co|oh cm|cm pro:dem|this cop|be&3S det:poss|your n|lion . *MOT: oh , okay . %mor: co|oh cm|cm adj|okay . *MOT: so this is your lion ? %mor: adv|so pro:dem|this cop|be&3S det:poss|your n|lion ? *CHI: this (.) I lion . %mor: pro:dem|this pro:sub|I n|lion . *MOT: this is just a paper . %mor: pro:dem|this cop|be&3S adv|just det:art|a n|paper . *CHI: this [/] this is I [/] I lion . %mor: pro:dem|this cop|be&3S pro:sub|I n|lion . *CHI: I am baby . %mor: pro:sub|I aux|be&1S n|baby . *CHI: you just eat orange . %mor: pro:per|you adv|just v|eat n|orange . *CHI: I am a boy . %mor: pro:sub|I aux|be&1S det:art|a n|boy . *CHI: 还有 我 这里 还 有 绿色 的 喎@s:yue . %mor: adv|hai2you3=moreover pro|wo3=I post|zhe4li3=here adv|hai2=still v|you3=have adj|lv4se4=green nom|de L2|喎 . *CHI: 三 个 副 [x 3] 队长 就 可以 了 . %mor: num|san1=three cl|ge4 cl|fu4 n|dui4zhang3=captain adv|jiu4=just v:aux|ke3yi3=may asp|le . *CHI: 你 想 不 想 放 什 [/] 什么 进 去 啊 ? %mor: pro|ni3=you v:aux|xiang3=want neg|bu4=not v:aux|xiang3=want v|fang4=put pro:wh|shen2me=what v:dirc|jin4=enter v:dirc|qu4=go sfp|a1 ? *CHI: but there’s something else (.) that have in [/] in there burnt . %mor: conj|but pro:exist|there~cop|be&3S pro:indef|something post|else pro:rel|that v|have adv|in adv|there v|burn&PAST . *CHI: &en 你 就 [/] &hm &hm 就 是 普通话 的 . %mor: pro|ni3=you adv|jiu4=just v:cop|shi4=is n|pu3tong1hua4=Putonghua nom|de . *CHI: <就 这> [/] 就 这么 吧 . %mor: adv|jiu4=just adv|zhe4me=like_this sfp|ba . *FAT: 好 [/] 好 . *FAT: 我 是 普通话 老师 . %mor: pro|wo3=I v:cop|shi4=is n|pu3tong1hua4=Putonghua n|lao3shi1=teacher . *FAT: 那 妈妈 是 什么 老师 啊 ? %mor: pro|na4=that n:relat|ma1&DIM=mother v:cop|shi4=is pro:wh|shen2me=what n|lao3shi1=teacher sfp|a1 ? *CHI: 妈妈 是 广东话 老师 , 英语 老 [/] &s 老师 . %mor: n:relat|ma1&DIM=mother v:cop|shi4=is n|guang3dong1hua4=Cantonese_language n|lao3shi1=teacher cm|cm n|ying1yu3=English n|lao3shi1=teacher . *FAT: 哦 妈妈 会 教 这么 多 . %mor: co|o1=chant n:relat|ma1&DIM=mother v:aux|hui4=will v|jiao1=teach adv|zhe4me=like_this adv|duo1=far_more . *FAT: 爸爸 只 会 讲 普通话 . %mor: n:relat|ba4&DIM=father adv|zhi3=only v:aux|hui4=will v|jiang3=speak n|pu3tong1hua4=putonghua . *CHI: 然後 [<] [/] 然後 就 養 大 咗 喇 喎 . %mor: adv|jin4hau6=then adv|zau6=then v|joeng5=raise adj|daai6=big asp|zo2=perfective sfp|laa3=persuasive sfp|wo3=epistemic . *CHI: 會 唔 會 俾 風 浪 吹 [/] 吹 (.) 咗 去 天 上 呀 ? %mor: v:aux|wui5=will adv:neg|m4=not v:aux|wui5=will prep|bei2=passive n|fung1=wind n|long6=wave v|ceoi1=blow asp|zo2=perfective v|heoi3=go n|tin1=sky v:dirc|soeng5=go_up sfp|aa3 ? *CHI: 我 停 在 消防车 的 上面 . %mor: pro|wo3=I v|ting2=stop prep|zai4=at n|xiao1fang2che1=fire_engine poss|de post|shang4mian4=above . *CHI: he lost his wheels . %mor: pro:sub|he v|lose&PAST det:poss|his n|wheel-PL . We would like to express our gratitude to Brian MacWhinney, Director of CHILDES for his expertise, advice and technical support in constructing the Leo Corpus. Our special thanks go to the research assistants and student helpers who participated in the project in one or more ways: recording the child’s speech data, transcribing the data, tagging and checking the transcripts: Sophia Zishu Yu, Riki Yuqi Wu, Hannah Lam, Joy Jieyu Zhou, Bill Wu, Christa Schmidt, Chang Wang, Michelle Tsz Hsing Au, especially Vaness Tsz Yan Law. We gratefully acknowledge the support and help of our lab members: Stephen Matthews, Xiangjun Deng, Gloria Yanhui Zhang, Elaine Lau, Emily Haoyan Ge and Jenny Jiangling Zhou. The research was supported by a CUHK Direct Grant awarded to Ziyin Mai (“Trilingualism in Early Childhood: Production and Comprehension”), and a start-up grant to set up the University of Cambridge-Chinese University of Hong Kong Joint Laboratory for Bilingualism at CUHK, co-directed by Virginia Yip and Boping Yuan.